Show off your love for painting and cannabis with The Magic Brush enamel pin. The Magic Brush enamel pin is a fun little play on painting on puffing with the weed leaf as the hand, and the smokey joint with wax on the tip as the paint brush. Perfect for any 420 loving artist. 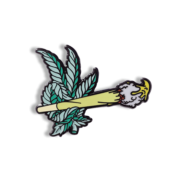 A fun weed/cannabis leaf holding a fatty joint.. or paint brush if you use your imagination. 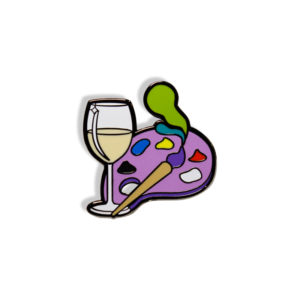 This is a must have souvenir for anyone who’s been to one of our “Paint and Puff” classes. The Magic Brush lapel pin is black nickel cast and is available in three color-ways. We’ve got, teal, green and of course purps ;). We only ordered a limited quantity this time around so be sure and purchase yours soon, because these wont last long! We’ve got more on the way! These are the first of a series of many new pins to come from The Paint Sesh. 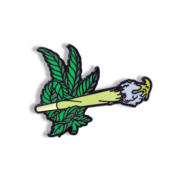 We’ve been working hard in the creative studio with our artist Chris Perez to create some fun art / cannabis / booze related lapel pins to commemorate your time with The Paint Sesh, show your flair, or gift to a friend.